On a sunny-rainy shore at the Baltic Sea, where coldness and snow should cover the land at this time of year – if it wasn’t for the so-called global warming, there is a windy-yet-warm city with red brick buildings, where people still populate lively terraces invigorated by heaters. Here, at night, you can walk the land and, from a simple bench near a little wooden bridge, you can look into the dark eyes of the sea, spluttering in the distance, or bump into wild brown rabbits playing on the bicycle lanes on the sidewalk, while the last tram still winks his red lights at the far corner of the street. 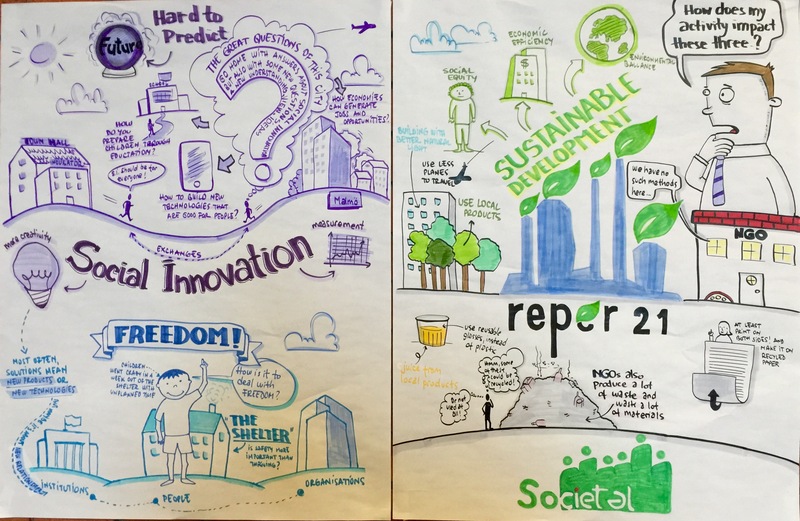 In this city, the city of Malmö, which is as new as it is old, I did graphic recording for Towards collaborative practices (November 24-26 | 2015), an European conference on youth work, social innovation and enterprise. These words could say nothing. But they say so much! The conference (basically stating that collaboration enhances innovation) takes place on the verge of a whole wave of social initiatives and youth projects, taking place all over Europe (and even the whole world). Yet, so few social entrepreneurs and youth workers know about the connection that exists between each other. It’s this mind-swirling fact that lead to the crafting of this event, where more than 90 youth workers from over 21 countries took part, searching for answers and information. The fact that most social workers deny, misplace or ignore their connection to social businesses and social entrepreneurs is not just strange, but it is also diminishing the possibilities that can arise from a better acknowledgement of this fact. Just because entrepreneurship is often linked to “business” and therefore to “profit”. In reality, any social project should actually be based on a sustainable business model (considering you want it to be successful). It mustn’t necessary bring any profit, but that doesn’t harm, especially because profit can be re-invested in stead of feeding the owners. Furthermore, in a better world, any sustainable business on Earth should also cover a social side. 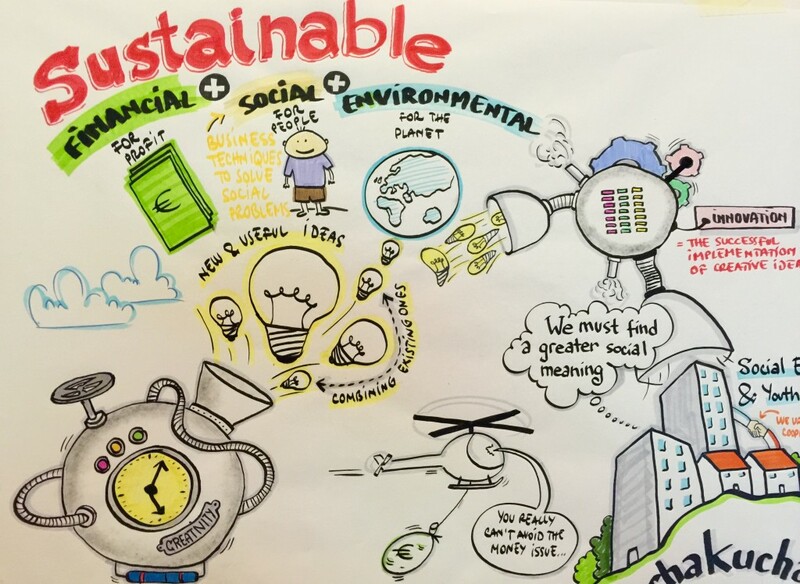 But what is a sustainable business? 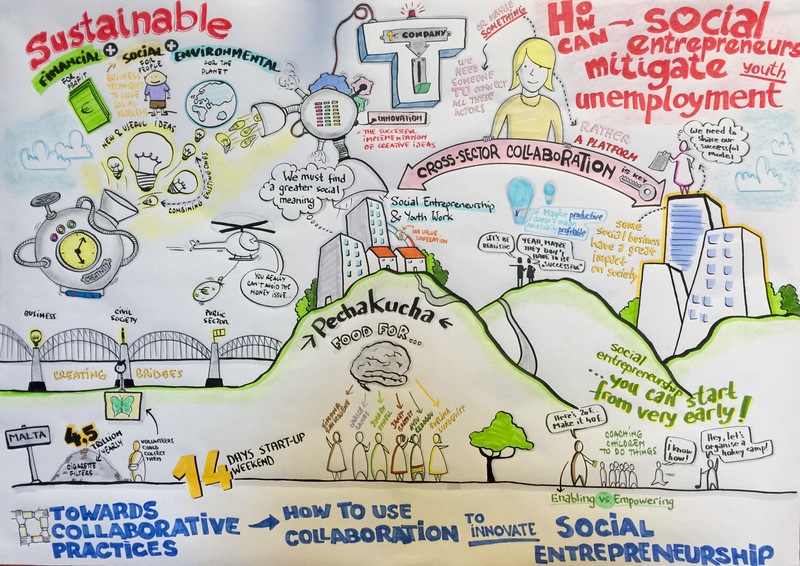 And what does social innovation mean? In other words, you can build the most beautiful project ever. If it’s not financially sustainable, it will die. One day, financial support from the Government, EU or other stakeholders could stop. Should the project cease at that moment, too? Through its activity, it involves disabled people and provides services, jobs and opportunities for the society. It doesn’t have the target of making money through marketing campaigns that tricks people to buy a certain product. Its aim is to help communities. When developing the products, services or ideas, the projects should not harm the local economy or the environment. Considering you might be working in the temperate zone, you could support the local economy and reduce consumption of resources by buying apples in stead of bananas for your employees. And definitely you could provide them recycling bins. And use reusable non-plastic dishes. And take the train in stead of the plane. Get the idea? Anyway, for this kind of improvements there are companies that can help you, like Romanian-based association Reper 21, who explain the principles in this video. Or you could just Google it. Only then, when the successful implementation of creative ideas have these three basic directions covered, could they be called innovative. Because it means they are so well shaped they can fit perfectly in a system where profit-oriented projects so often outweigh the things that the world really needs. Of course, as these things will start to happen more often, they mustn’t only be robotically implemented, but also measured and adjusted. And, truth be told, this future isn’t so far actually, as cities and countries and even businesses decide to support more and more social projects by offering them spaces, financing incubators, enhancing legislation, lowering taxes and helping them come together on a common ground. In a way, all these things are just staring out, and yet they have been already happening for so long.